Buy premium quality Black Pepper Seeds at nominal rates from us. The company is a reputed Supplier and Exporter of Black Pepper Seeds from Thailand. Health benefits of Black Pepper Seeds include relief from respiratory disorders, coughs, common cold, constipation, indigestion, , impotency, muscular strains, dental disease, and heart disease. 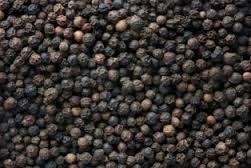 Owing to our reliable logistics network, we are capable of delivering bulk orders of the Black Pepper Seeds.